Greetings from a very snowy western North Carolina. We have about eight inches right now – expecting about another ten more. I am happy that the book on the Fifty-eighth NCT finally has a front cover. I like it – what do you think? I’ve found a couple of interesting items in the last few days that I thought I would share. The 26th North Carolina Troops (reactivated) has released a great new recruiting video. Check it out here. Great article talking about Mt. Jefferson in Ashe County being used as a refuge for runaways (slaves, Tar Heel Citizens, escaped prisoners) at the Mountain Times. You can check it out here, along with a few comments from your humble scribe. The Mount Airy Museum of Regional History will be having a special program on North Carolina Women and the War on Thursday evening. You can get more information here. There is some good information about the town of Mooresville in this article. If you have been following this blog for any length of time, you have probably noticed that blog posts get kind of slim in the month of December. By December every year, I am tired – tired of writing, tired of blogging, tired of answering email, tired of traveling. This year is a little better. I’ve been tired since October, and I’ve tried really hard to take it easy. I’ve been reading, sitting on my porch, playing with my kids, and reflecting. A lot of reflecting. I have four projects sitting here in my office that are one or two research trips away from the writing process. 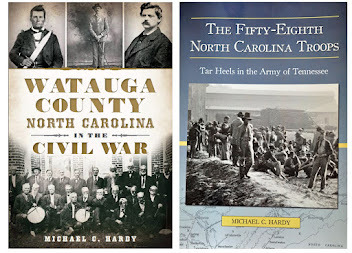 Three of them focus on North Carolina and the war, and the other on one of the most famous individuals of the war. That project has been ready to go for some time, and I actually have the first two chapters finished, or at least in draft form. For some reason, I’ve not been able to jump and get this one finished. Maybe it is the almost foot-high pile of primary research that needs to be culled through. I’ve also got a fifth project that I’ve been dabbling with the past couple of weeks. To be honest, I will probably not do anything until the first of the year, and then it will be time to go back to work. 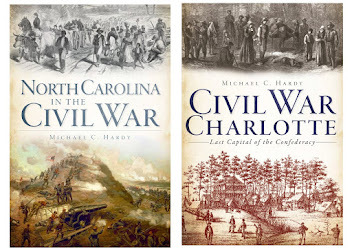 As I have written before, there is so much that still needs to be done, researched, and written about to understand the role of North Carolina and the War. I could not begin to tell you the number of emails that I get from people wanting to know when I am going to write about this regiment, or that person. No, I’ll never be able to get to all of it. But I look forward to seeing what I can accomplish. I am looking forward to next year. I’ve got some “first rate” things that I’ve found recently that I look forward to sharing. And, I’ve a few more trips planned. May try and go back to Gettysburg. The 58th NCT book will be released, and I’ll be traveling around promoting the book. I am hoping to do a mini-reunion at Chickamauga. The plan is to invite all those folks I have corresponded with for the past decade and explore the role of the 58th NCT at that battlefield. Maybe we could do a similar trip to Bentonville. Well, I’ve probably rambled enough here this morning. – Y’all have a great day. 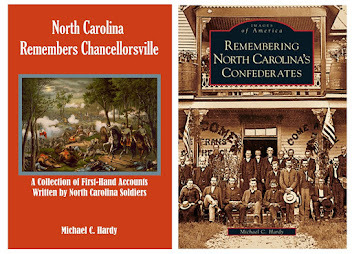 Interesting article today on North Carolina Miscellany blog. 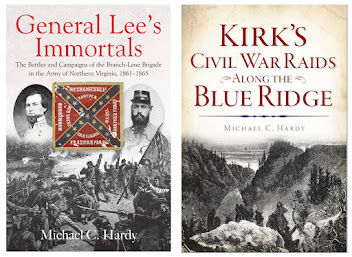 The article tells of a true Northern soldier (not one of our home-grown Yankees) who took a little trip through the South, including North Carolina, in 1868. What I find interesting is how this former soldier was treated by the former Confederates. Several months ago, I had a good argument with an acquaintance on this very subject. His premise was that the vast majority of Southerners, following the war, would have rather bushwhacked this chap than give him a carriage ride, or three cheers. Do I doubt that there were some in the South that hated those from the North? No, not one bit. However, to not help someone in need, or to not stretch out the hand of friendship to a passerby, is a strictly un-Southern attitude. This brings to mind another conversation that parallels the thought above. At one of our recent round table talks, the conversation turned to commanders of the local home guard companies here in western North Carolina. Two of those commanders, the ones for Watauga and Yancey Counties, were forced to relocate after the war. I wonder how many of the others were forced to move out of the area after the war? 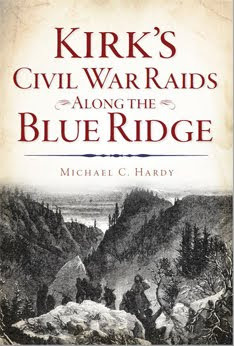 I know that Watauga County’s Home guard commander, Harvey Bingham, had to leave because of the way he enforced state and Confederate laws. Bingham did return for a short time, but later settled in Iredell County where he ran a law school. Just random thoughts for today. You can check out the article at North Carolina Miscellany here. 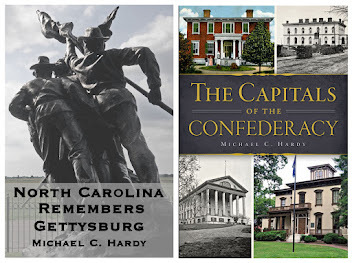 Folks – I’ll be speaking this evening at 6:30 pm at the Rowan County Public Library in Salisbury. Topic will be my program on Gravestone Art, which includes over 100 images of gravestones that I’ve taken over the past ten years. Drop by and say hi! This past Saturday, I was at the Appalachian Authors’ Festival in Old Fort, North Carolina. There were several other authors there, including Richard Russell, editor of Fear in North Carolina: The Journals and Letters of the Henry Family (great book if you don’t already have it!). I was surprised to see David Madden, founder of the U. S. Civil War Center at LSU and Lincoln Bicentennial Member. We had a very interesting talk about the upcoming sesquicentennial of the War. One part of our conversation centered on what appears to be a lack of community input and participation in our upcoming sesquicentennial plans. 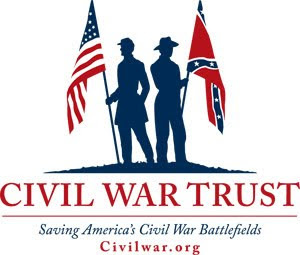 Sure, the state has a web page, but look at the North Carolina Civil War Sesquicentennial Committee – every single person on this Committee works for the state. Look at the plans of the sesquicentennial committee – academic symposiums to be held in Raleigh, Wake Forest University, and (probably) UNC-Wilmington. The committee plans to hold programs and events at thirteen of the state’s historic sites (two each year per site). That’s great. What about the dozens of historic sites across the state that are not within the state’s system? I can think of three historic sites within an hour of my house – has anyone from the state contacted them to see if they are interested? This is not to bash the folks on the Commission – this is just to say that the focus seems a little one-sided. I took a look at the Sesquicentennial plans in Virginia. Their commission seems dominated by politicians. While I do not think that this system is the best, at least they are answerable to the people. What is nice to see is that just about every county, and a few of the large cities, have formed their own sesquicentennial committees. Wow – the entire state working together. Sure, I know, some of these committees will be working harder than others, but at least something is happening. Most you know that I have been working on promoting an open discussion about the war in the western part of the state. I’ve been working in five different counties, trying to get people out and talking about the War, both in terms of the men (and women )who marched away, and the events that took place at home. I am going to continue to do this, and I hope to expand in the next couple of years. As I told Madden on Saturday, I would love to see this type of local dialogue happen in each of North Carolina’s 100 counties. I would love to be a part of each one, which is probably not a very realistic goal. But, if I can work with the counties that are interested and the counties that are nearby, then maybe something can happen to educate and preserve what took place 150 years ago. Maybe I’ll even head down to the next Avery County Commissioners meeting to try and get approval for a local Avery County Sesquicentennial Committee. Come on North Carolina, you supplied more men and lost more men than any other Southern State. We can do better than what we are doing. 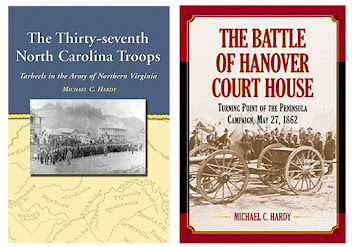 The Appalachian Authors’ Festival is today in Old Fort in McDowell County, from 12:00 pm until 3:00 pm. It is being held this year in the old Train Depot/Museum. If you are in the area, stop by and say hi! Well, let’s have a little look around the Old North State to see what is brewing in the news. The Sun News (Raleigh) had an interesting article on a soldier in the 15th NCST who suffered from PTSD (even though the article does not quite go that far). The soldier ended up in the NC State Insane Asylum and is buried in the hospital’s cemetery. The article can be found here. 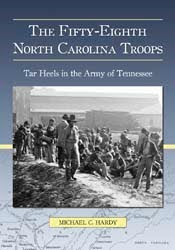 Rob Neufeld continues his writings on western North Carolina and the War with an article on Thomas L. Clingman. It is interesting that while Neufeld calls Clingman that “fire eater from the Carolina mountains” due to Clingman’s stance on secession, he makes no mention of that fact that Clingman owned no slaves. Check out the article here. Another article dealing with the battle at Deep Creek appeared recently in the PJStar (Peoria, IL). Read more here. The Mount Airy News reports on a living history held recently Horne Creel Living History Farm. Check it out here. Check out this article on the cemetery at Mount Bethel Evangelical Church in Summerfield.